​We have a large stock of chemicals for easy pool & spa care. Have a problem with water chemistry? Not sure what you should be using? Our staff can help you to understand and improve your water's chemistry. Liquid Cover’s advanced mono-layer technology offers users the ability to save water and money by dramatically decreasing evaporation and heat loss. ProZymes is a concentrated naturally based enzymereduces the buildup of non-living organic contamination. Sunscreens, body oils, lotions, cosmetics along with other contaminants make up the non-living organic load that contribute to problematic symptoms such as: waterline rings, short cycling filters, unpleasant odors, poor water clarity and peak load cloudiness. Stain & Scale Control protects pools from the damaging effects of scale buildup and staining due to excessive calcium, iron, copper and other minerals. It works without the use of phosphates or harsh acids. This product also works very well at preventing/reducing scale from forming on chlorine generator cells and UV crystal lens in order to help maintain optimum performance. Natural Clarifier is made from the recycled shells of crabs and various sea life. Crabs and other crustaceans have a product in their shells called chitosan that attracts small particles of debris in water. Use to effectively and quickly clear problem water or to polish dull water by removing small suspended particles. PRO SERIES Natural Clarifier is environmentally safe. 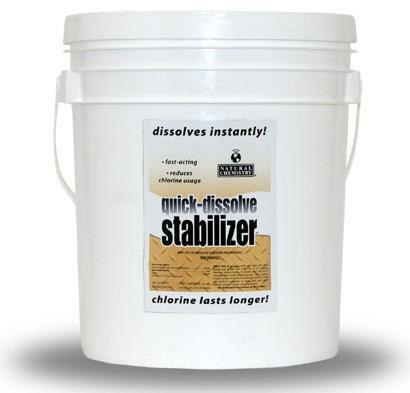 Quick Dissolve Stabilizer contains monosodium cyanurate monohydrate, a quick dissolve form of cyanuric acid. It is a unique technology that starts to dissolve instantly and begins working immediately to protect chlorine from the sun’s ultraviolet rays. The neutral pH and concentrated formula make this a great alternative to traditional cyanuric acid. CYA Removal Kit efficiently removes cyanuric acid from pool water. This revolutionary two-part system works without the need to drain or dilute water from a pool. CYA Removal Kit takes cyanuric acid (also known as CYA, stabiliser or conditioner) out of pool water. 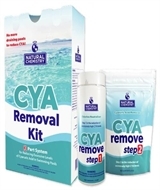 CYA Removal Kit reduces high levels of cyanuric acid to help you achieve the ideal range for a swimming pool of 30-50ppm. Pipe Purge attacks contaminants like oils, lotions, sunscreen, cosmetics, and hair products. These create high non-living organic loads that can cause cloudy water, hard to maintain water chemistry, clogged filters, foaming and nasty waterline rings. These contaminants collect and buildup in pool circulation systems and filters. By purging the pool of this buildup, the symptoms of high non-living organic loading will be reduced. 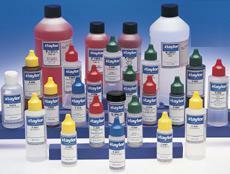 Stain ID Kit is the first step in performing a successful Jack’s Magic stain removal. The Stain ID Kit is designed to take the guesswork out of removing swimming pool stains. One of the (4) simple topical tests will identify what bests removes a swimming pool stain, saving both time and money. The Iron, Cobalt, &Spot etching Stuff-(Stain Solution #1) is a non-acidic product for removing iron, cobalt, and spot-etching stains from all types of pool surfaces without draining the pool. It will normally remove these stains easily and effectively within 48 hours, with minimal rebalancing of other pool chemical products. The Blue Stuff- for metal staining has a proprietary blend actually removes copper from the water. “The Blue Stuff” is also very stable in higher chlorine levels and can be used in many fountain and water feature applications. The Copper & Scale Stuff - (Stain Solution #2) is designed to safely and effectively remove copper stains and scale from all types of pool surfaces without draining the pool. In most cases, The Copper & Scale Stuff is more effective than acid washing the pool, and will save both time and money.